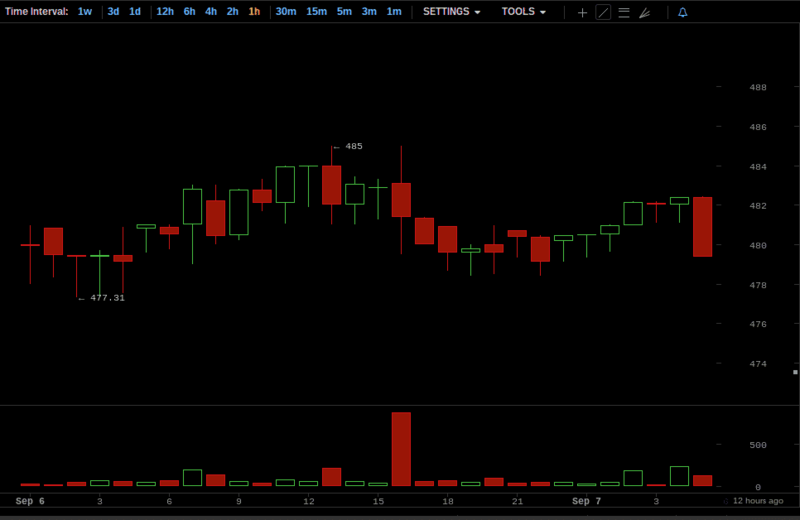 This installment of Coin Brief’s weekly Bitcoin price report covers the week of August 31 to September 6, 2014. This week was mostly a bearish one, with the price decreasing by a total of 4.76% for the week. In this report, we will look at the daily opening prices on the Bitstamp Bitcoin exchange, provide a more detailed description of the daily price movement in our weekly recap, and then provide a general forecast for the movement of the Bitcoin price in the week to come. 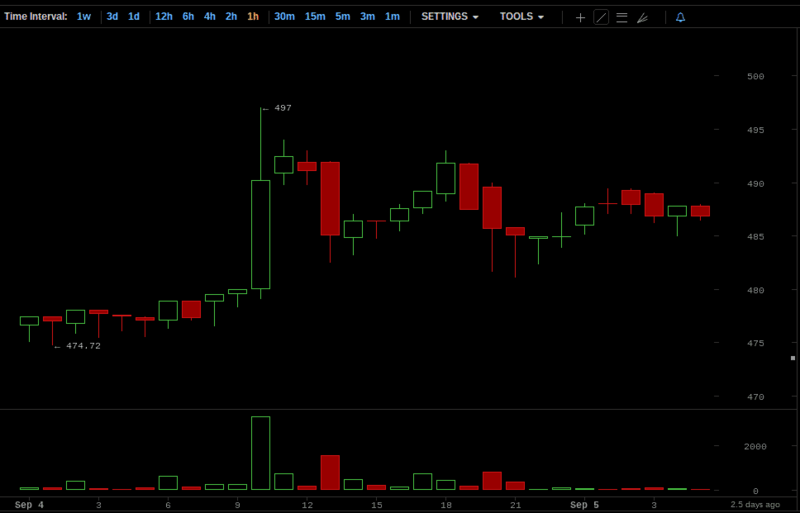 The week started out on August 31, 2014 with the Bitcoin price at $504. The day started, at midnight, on a decline that would characterize much of the week. 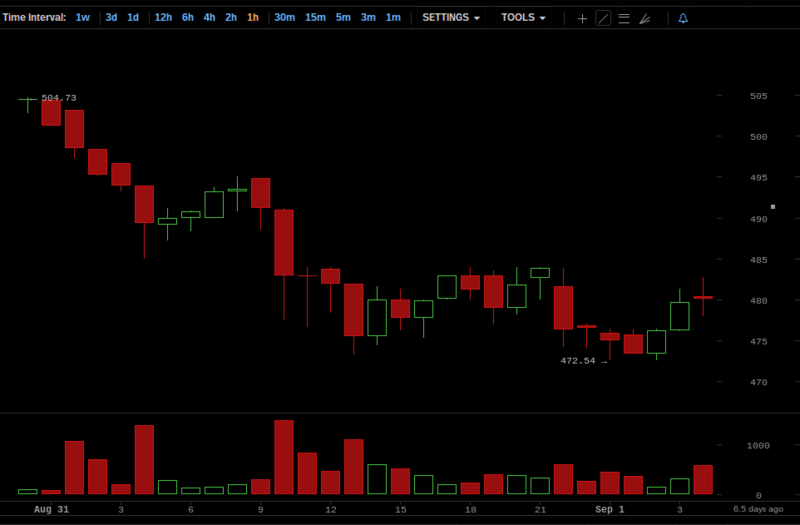 The price fell from $504, at the beginning of the day, to $484 at noon, and $482 by the close of the midday hour. The Bitcoin price for the rest of the day remained relatively flat, hovering between the high $470s and the low $480s, and closed out at $476. Monday, September 1, started at $476, down 5.56% from the previous day. 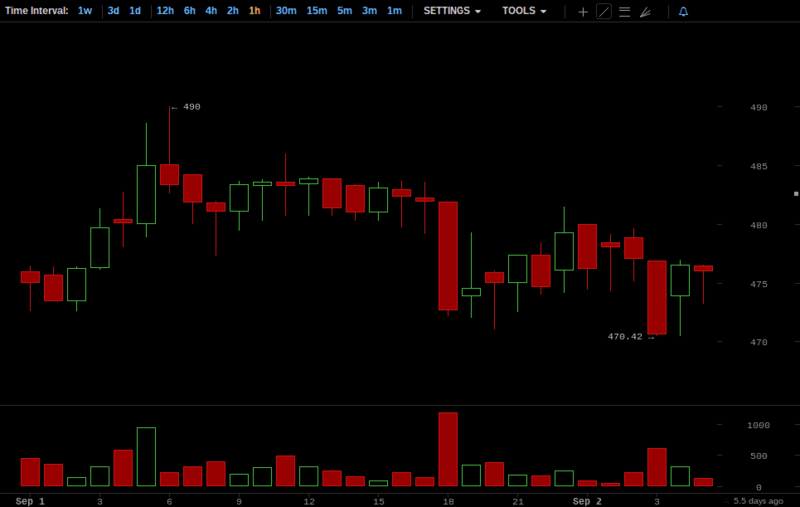 The price gained some ground in the early morning hours, going from $476 at midnight to $485 by the close of 5 AM. The price remained fairly flat for the majority of the day, however, staying in the low-to-mid $480s until 6 PM, when the price plunged from $482 at the top of the hour to $473 at the close of the hour. 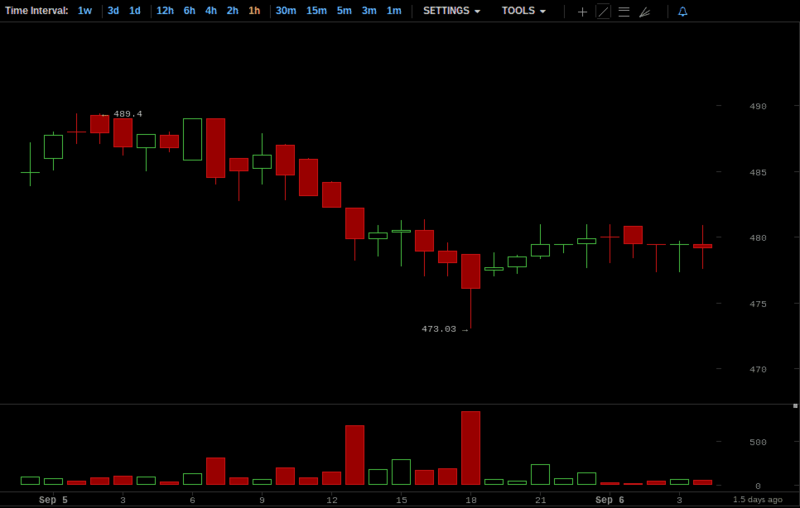 The price recovered slightly from that sharp drop, though, and the day ended at $480. The 2nd opened at $480, up 0.84% from the start of September 1. The first half of the day brought forth a mild incline; the Bitcoin price reached $483 by noon, with an hourly high of $484.61. Those gains were lost at 3 PM, though, with the hour opening at $483 and closed at $477. The price spent the rest of the day in the high-to-mid $470s, closing the day out at $477. This day began at $477, marking a 0.63% decline from the opening price on September 2. This day was a relatively flat and inactive one, with the Bitcoin price hovering between the high and low $470s all day. The day ended, at midnight, at $477. September 4 was a much more active day than the 3rd. The day began at $476, down 0.21% from the start of the previous day. For the first part of the morning, the price stayed in the high-to-mid $470s. But then, at 10 AM, there was a surge in buy volume and the price shot up from $480 at the start of the hour to $490 at the close, with an hourly high of $497. At 1 PM, the Bitcoin price fell from $492 to $485, and stayed between the low $490s and the mid $480s for the rest of the day. September 4 closed at $486. The 5th of September started at $486, up a generous 2.10% from the previous day. However, the 5th saw a steady decline, losing all of the bullish gains made on the 4th. At 6 PM, after falling for the entire day, the price took one, final dip from $478, at the top of the hour, to $476 at the close, with an hourly low of $473. The last few hours of the 5th brought a slight recovery to the bearish day, returning to the high $470s and finally ending the day at $480. Thanks to the slight, last minute recovery at the end of September 5, the Bitcoin price at the start of the 6th was $480, a 1.23% decline from the open of the previous day—a much less severe loss than the one we would have had without that last minute price increase. This final day of the week was relatively quiet, hovering between the high $4s0s and the low $480s for the entire day. September 6 ended at midnight, thus closing out our week, at $480—a 0.00% change from the start of the day. Briefly looking back to the ceteris paribus (all things remaining equal) forecast from last week’s Bitcoin price report, we will see that the actual price activity followed the general, downward trend set forth in our forecast. Last week, we said that, ceteris paribus, the price would continue falling until it reached a point where individuals would begin purchasing again. That general forecast proved to be true. The price fell continuously for most of the week, with an overall decline of 4.76%. 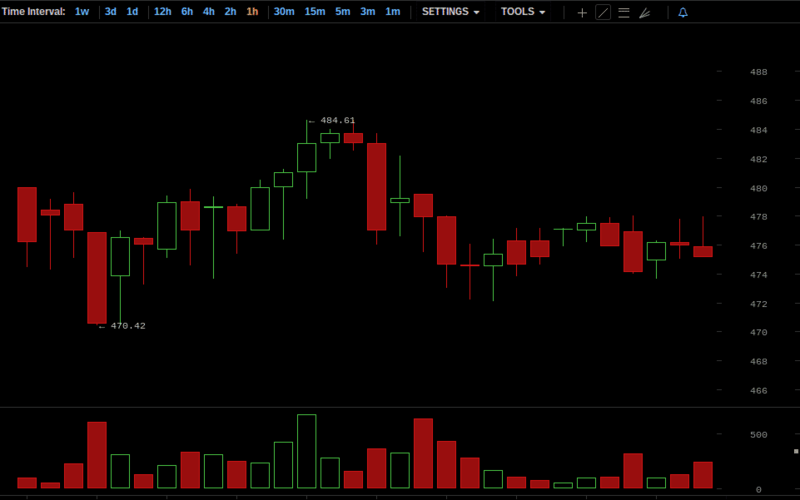 As for our forecast for next week, it is not as clear as the one from our previous Bitcoin price report. The decline of the price seemed to meet some resistance in the mid $470s, and the price even made small gains towards the end of the week, with the closing price on the 6th being $480. So it is possible that the decline could be easing up. Therefore, we will advance two possibilities for our ceteris paribus forecast. On one hand, the price may level out, remaining between the low-to-mid $470s and the $480s. 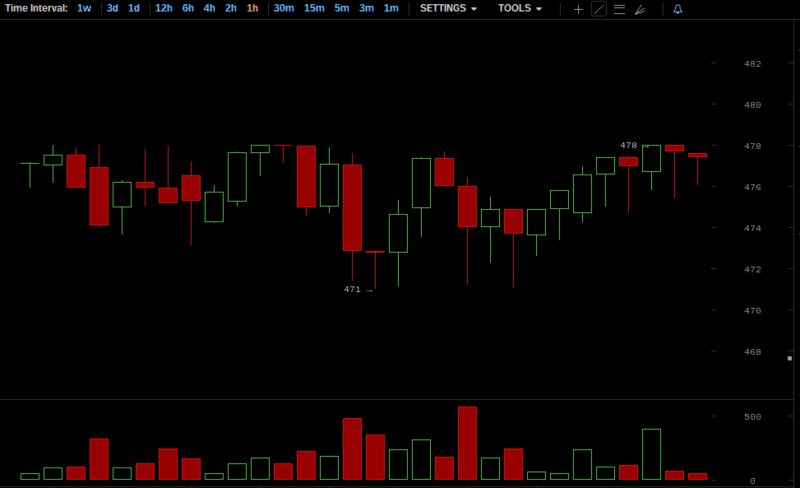 On the other hand, the Bitcoin price could continue its decline, the extent to which cannot be determined.